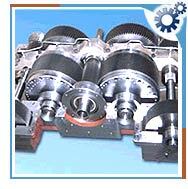 The gears that have parallel shafts are spur gears, helical gears, and herringbone gears. These are the gears that mesh in the same plane. They are used for transmission of rotary motion between parallel shafts. They offer maximum transmission of power and high efficiency. They are used in higher horsepower applications where long-term operational efficiency is more important. They are more expensive to manufacture and create axial thrust. They have higher load capacity and make less noise. They are generally used in clocks, movie projector and car steering. They are widely used for manual transmission.